Soak tamarind in water for 30 min. squeeze it well to get enough flavour & water out of it. Heat oil in a pan. Temper with mustard seeds, split chenna dhal, curry leaves & fenugrek seeds. Add in the whole shallots & allow it to sweat. Add diced tomatoes & drumsticks (1cm long cut) and allow to cook. Add in the sambar powder, tamarind water & salt & allow it to boil. Once it reduces add in the pressure cooked tuvar dhal & mix well. Allow it to boil & serve hot with rice accompanied with any kinda foogath(vegetable sidedish). sambar looks delcious Srikar's... yummmy. Thxs for ur quick comment Bhawana..
Wow wat a colour..lovely entry..
Looks delectable. Iam drooling over. hmmmm sambar with shallots....looks nice...u make ur own sambar masala or use some brand?? I love sambar and this looks so yumm. Rice and sambar is my second comfort food. After dal and rice. 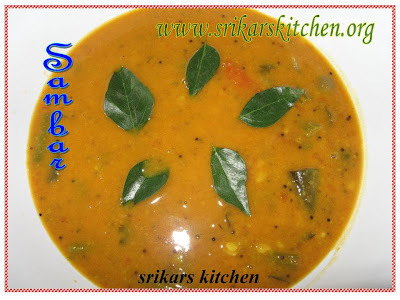 Who can resist that delicious sambar? Picture perfect.